Tenura Extreme grip mats are unlike any of our other daily living aids. This material does not offer the same kind of non-slip surface, but instead offers an incredibly tacky surface, helping to prevent all movement from any object which is placed on upon it! This high quality material has received a very warm reception since we announced it, as the grip levels it creates are very strong. This allows you to use it in areas prone to movement, such as cars, Mobile homes, and boat interiors! When travelling around in a motorhome or caravan, you will use a lot of items such as pots, pans, plates and cutlery. This can all move freely when travelling that could make unwanted mess, cause damage to them, the aesthetics of the motorhome or distract you whilst driving. Tenura extreme grip mats can be used to help prevent this eventuality, by creating such a tacky surface, it prevent all movement from objects in low and high movement areas, preventing G force or lateral movement of the vehicle from moving the objects residing in it. Extreme grip mats can be found in green and transparent, so depending on your needs, can be easily seen or virtually inconspicuous. Tenura extreme mats can provide a perfect surface to rest these items on. This materials Tacky surface will prevent objects from moving, no more will keys and phones fall down the sides of your seat! Tenura extreme mats have shown over the years to be very useful in many areas of everyday life we never gave a thought to. One of the most interesting ones we have had was keeping an IPad in place for a disabled person who would otherwise struggle to interact with the software on the tablet when the device is constantly moving around ( we recommend the use of a cover for a tablet before adhering it to the surface ). Extreme grip mats are perfect for many uses in the home, thanks to their strong grip and the fact that they leave no residue behind on a surface they have been stuck to. 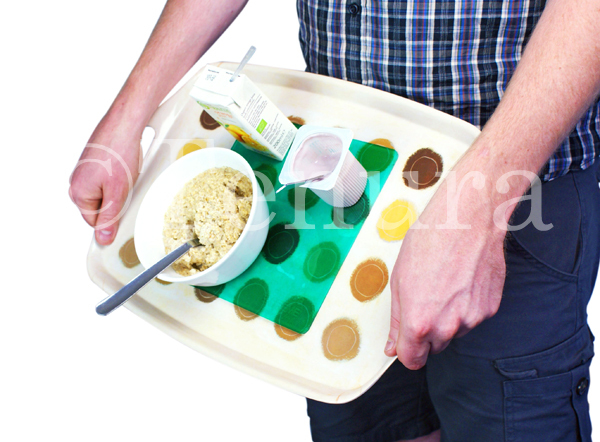 One of the best tests which shows how strong the tacky surface of Tenura extreme mats is on a dinner tray, the material will prevent any and all movement from bowls, plates, cups and cartons which could otherwise move around. Eating and drinking can be especially troublesome for those who suffer from disabilities which impair motor function and grip. This tacky surface will make sure that the bowls, plates and other items cannot move freely and will stay put. Tenura Extreme is often used on our demonstration displays at exhibitions, you will be able to see this at the upcoming Arab Health, where we be situated at Hall 3, Stand Z1E12 Dubai International Convention & Exhibition Centre. Due to this level of grip, this material will get dirty quickly, as any dust, food fragments or general dirt which comes into contact with this material will stick firm. Most mats with this similar grip would have to be thrown away as washing them isn’t an option. Thankfully Tenura Extreme grip mats construction allows them to be washed thoroughly without losing any of its non-slip properties. Applications of soap and water will be more than enough to clean this material, then once dry; it’s properties will return. Tenura Extreme mats come in a Transparent and Green colours. The vibrant green colouring is a perfect aid for the visually impaired, creating a great marker for where an object may be resting, whilst the transparent style of the material is designed to create a subtle non-slip surface without detracting from the looks or features of what it rests on. Posted in Daily Living Aids, Independent Living, Tenura Updates, Tenura Videos on 1st February 2016 . That’s right, we’re having a sale! All of our products currently have a 25% discount, combined with free shipping on orders over £35, makes now a great time to get yourself a complete range of daily living aids for around the home. Pop over to the home page and start buying some of our fantastic products, and save yourself some money while you are at it! Posted in Arthritis Aids, Daily Living Aids, Tenura Videos and tagged daily living aids, discount, sale, tenura on 19th August 2014 . After days slaving over the editing process ( still a long way from being Steven Spielberg! ), we can finally present you with the next installment in the Tenura series; Anti Slip Aqua Safe strips and discs! Take a look at the video below, and as always let us know your thoughts! Posted in Tenura Videos and tagged aqua safe discs, aqua safe stickers, aqua safe strips, tenura video on 25th October 2011 . I do hope you enjoy watching it as much as I did making it, and if you have any comments on the video, then please feel free to let me know, as improving my techniques through new skill sets and ideas is what keeps me going. Posted in Assisted Living, Daily Living Aids, Independent Living, Tenura Videos and tagged anti slip, disability aids, grip, tenura, video on 19th August 2011 .